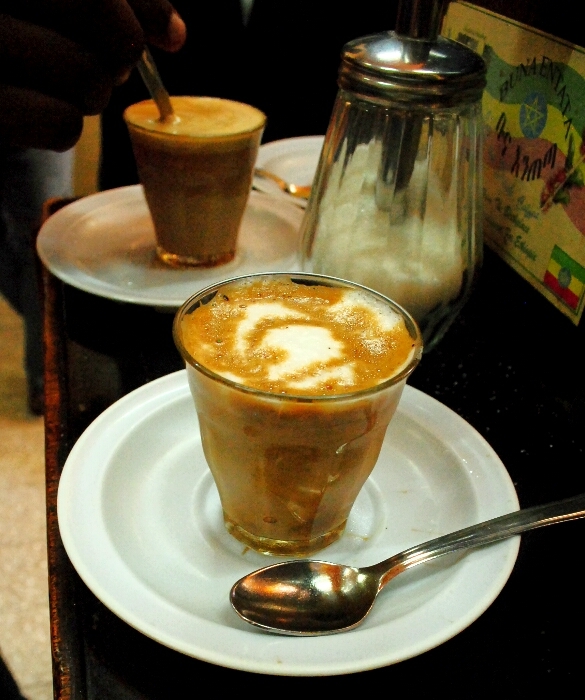 My inspiration to travel to Ethiopia came while drinking a cup of coffee that tasted like cardboard. I wanted good coffee, and I felt that Ethiopia would have that. After all, my experiences in America had taught me that Ethiopian Arabica roasts were medium-bodied, fruity, and exactly the thing to cure my coffee doldrums. As with many other places that are famous for their coffee though, Ethiopia tends to send the best of their beans abroad as a cash crop, and it turned out that getting a delicious Ethiopian roast in Ethiopia was trickier than I had expected — which is why my friend and I decided to head to To.mo.ca (an abbreviation for Torrefazione Moderna Café). 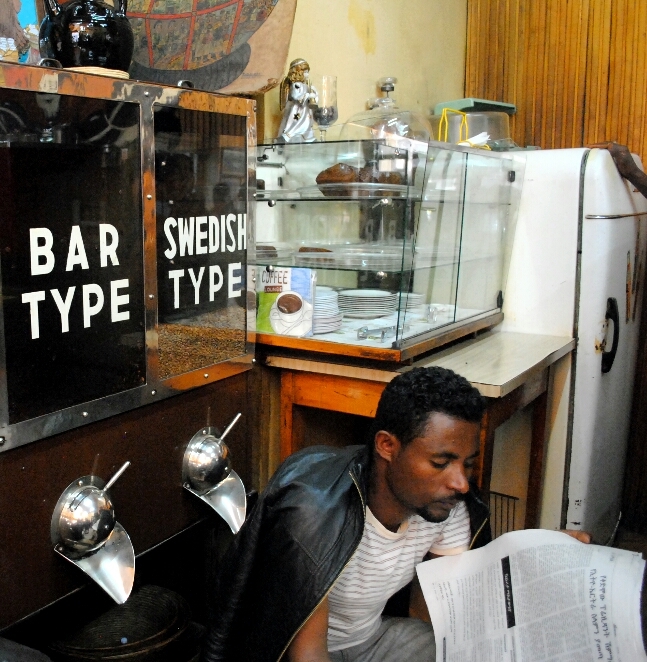 Although firmly on the tourist circuit, this coffee shop run by Addis Ababa’s oldest coffee roasting company has still preserved much of its original ambiance, and is still largely frequented by nearby businessmen and other locals looking for a quick pick me up. 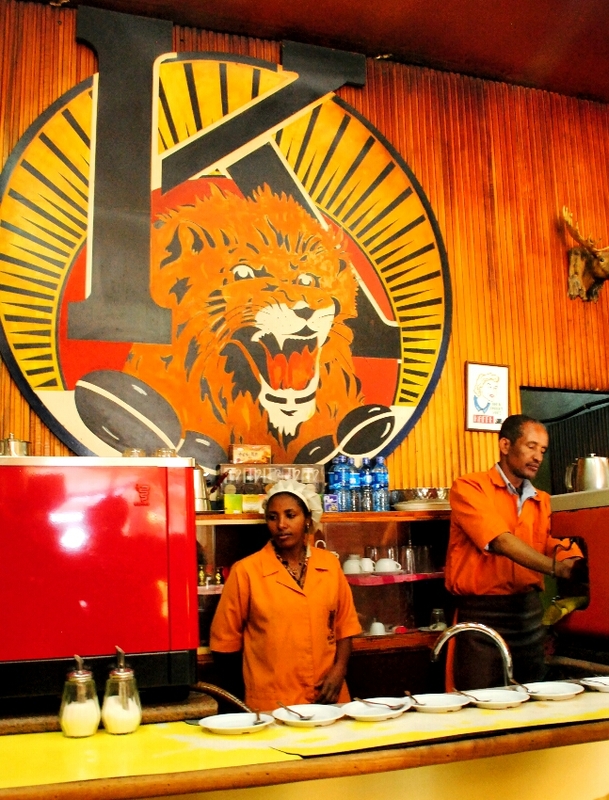 Since their founding in 1953, they have since expanded to two other locations in Addis Ababa, but we wanted to check out the original on the Piazza’s Cathedral Street, where we felt the personality of it’s original years would be most in tact. So, with a hand-drawn map on the back of an old receipt, we left our hotel in search of the famed coffee shop, but couldn’t seem to find it. We continued for blocks past where we thought the shop would be, into slightly sketchy territory, but eventually gave up and settled on one of the stylish, modern cafes abundant in Addis Ababa. Disappointed, we vowed to try again the next day. Turns out, the place is so unassuming from the outside, that we had walked right past it on our first try! Marked only by a small, simple brown sign, To.mo.ca is easy to miss if you’ve never been there before. Fortunately, we walked slower on our second attempt, and this time spotted the small hole in the wall, just past the intersection with Churchill Avenue and went inside. Once we entered, we were surrounded by the sweet aroma of freshly brewed coffee and the loud clamor of tiny glass and ceramic mugs against saucers, the tell-tale hiss of an espresso machine, and lively conversation. The place was full with customers — mostly men — standing around tall tables chatting with friends or pouring over the newspaper on small stools while sipping on To.mo.ca’s espresso-shot sized cups of buna (black coffee), makiato (coffee with milk), or capucinnos. All their coffee is slow roasted using a traditional Ethiopian process but in modern Italian-made roasters to bring out a fuller flavor and aroma from their Ethiopian Arabica beans. Even before tasting their coffee, I could smell the result of the time and care they had put into getting a quality roast out of a quality bean and felt myself bubbling with excitement as we approached the counter. And how was the coffee? Everything I expected of an Ethiopian coffee roaster with 60 years to perfect their craft. The small cup of buna tasted rich and strong and left us feeling revived and ready to dive in to the chaos of Addis Ababa’s downtown area, or perhaps, inspired by the Balzac quote hanging from the ceiling (“When you drink a cup of coffee, ideas come marching like an army”) write a short story. We even debated taking a bag of one of their several roasts on the road so we could enjoy the aromatic flavors of To.mo.ca even after we had long left Ethiopia’s capitol behind. But in the end, we decided against it. Sitting in the bustling atmosphere of To.mo.ca’s original coffee shop was part of the reason that made that one cup so enjoyable, and even if we could take the taste home with us, we would never be able to fully recreate the experience of sipping downright delicious coffee with the locals at To.mo.ca in Addis Ababa. Thank you! You two were smart to request coffee from your Ethiopian friends — it was delicious!